In conjunction with the Halloween month, Potong Pasir CC YEC is proud to present our very own Halloween experience within the heartland! 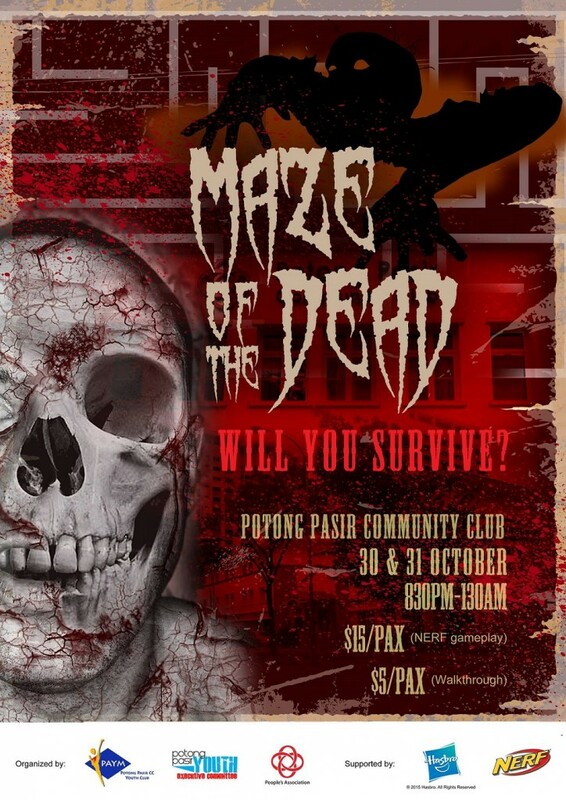 Singapore’s very first NERF Halloween Maze of The Dead will be coming to Potong Pasir CC! Public walkthrough of the maze, as well as NERF Gameplay will be available for registered participants. Come on down to Potong Pasir CC to experience the Halloween atmosphere! Participation is open to ages 10yrs and above. Definitely not for the faint-hearted. Simply visit any community centre and flash the activity code (A23752488) to register. Tickets will be sold on the day itself too, purchase now to prevent queuing. Do remember to keep the receipt and present it during the event. 1) The Nerf Walkthrough event is recommended for mature audiences ONLY. 2) We strongly urge parents with children under the age of 14 to reconsider visiting this event with their children if they are not prepared for it. They will be exposed to extremely terrifying incidents within the maze. There are no refunds for this event. 3) The Maze has blinking lights, total darkness and scary tactics. Sudden movements and scare props are used in the maze. Individuals with certain health conditions should consult a physician or consider avoiding the maze altogether. 4) Re-entries are not permitted. Tickets can be purchase at Potong Pasir CC and any CC.